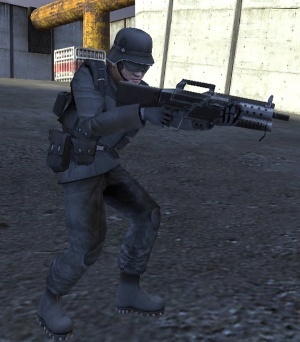 Bringing up the iron sights (default: right click) gives an accuracy bonus of another 25%, but cuts the moving speed in half in standing and crouching positions. Moving in iron sights mode while prone removes iron sights. The sticky bomb is extremely effective against enemy vehicles. A single bomb deals 300 points of damage and is often able to kill a heavily armored tank. The only down side is that you must get withing a meter or two of the enemy vehicle in order to score a hit. Bear in mind that it deals only 150 damage to the heavy armor of the CV. First Upgrade: Accuracy: Rarely will you ever choose anything but accuracy as a Rifleman. Getting more bullets to hit your target will maximize your damage over time; even more efficiently than the Improved Damage upgrade. It will also increase your effective range, which is essential on large maps. Essential Skills: Improved Damage: This skill means that you can drop your targets faster, which gives them less chance to hurt you. Health Upgrade: Front-line infantry cannot avoid taking damage: this upgrade will help you to live longer, and give you the necessary edge in some fights. Dig-In: Effectively converting your extra stamina into health, combine this with Health Upgrade and you become your squad's human tank. 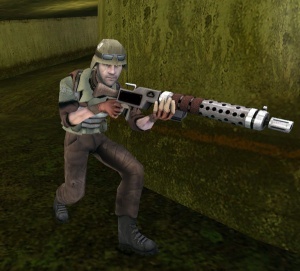 Heavy Machine Gun Skills: The Heavy Machine Gun operates by draining your stamina bar. This means that the useful skills for it vary from the usual rifleman skills - you'll have to conserve your stamina in every situation, which means Stamina Upgrade is essential, and the Speed Upgrade is nice to compensate for the lack of sprinting ability.